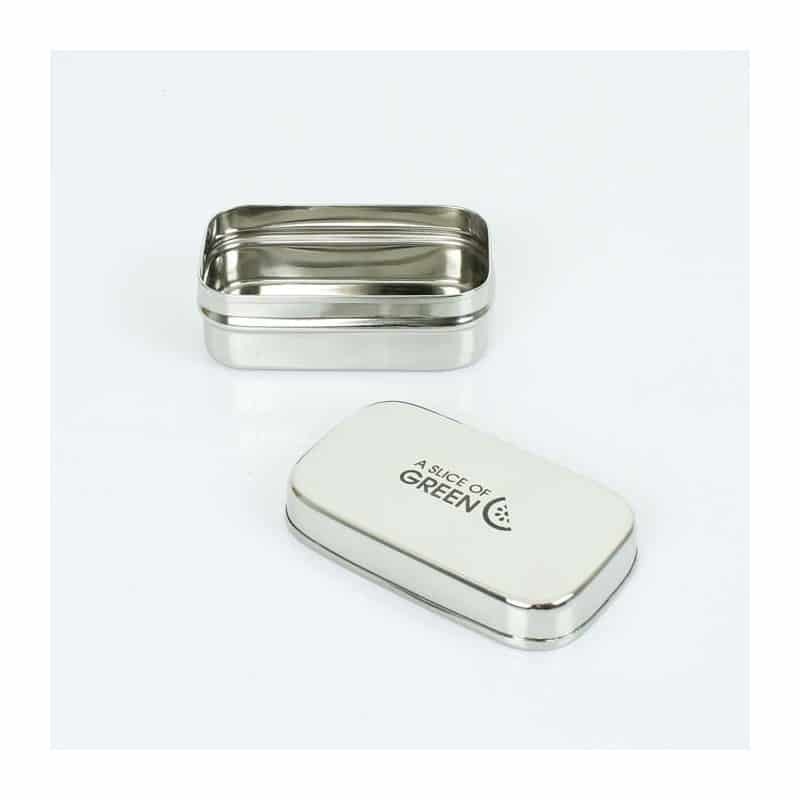 Small rectangular stainless steel container which is ideal for taking snacks out and about. Also useful for dips. 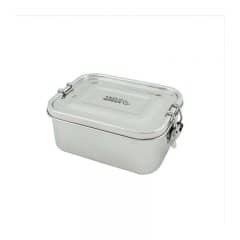 Please note that because the lid does not have a plastic seal, there could be some leakage if used with very wet foods or liquids. 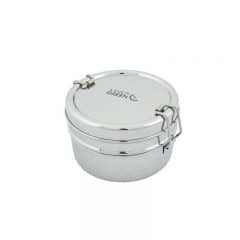 Round stainless steel lunch box consisting of two tiers with clip closure. Ideal for taking an ‘on-the-go’ balanced lunch of a savoury salad or sandwich, fruit and a snack to work in one neat container. Please note that because the lid does not have a plastic seal, there could be some leakage if used with liquids. 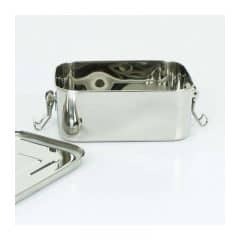 Unlike plastic, stainless steel is non-toxic and non-leaching and will not retain or impart flavours. Top Layer – 5cm x 13cm dia. 500ml capacity. Bottom Layer – 4.5cm x 13cm dia. 300ml capacity. 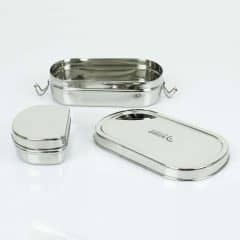 Rectangular stainless steel lunch box with clip closure, consisting of two tiers and a separate mini container which fits inside. Ideal for taking an ‘on-the-go’ balanced lunch of a savoury salad or sandwich, fruit and a snack to work in one neat container. 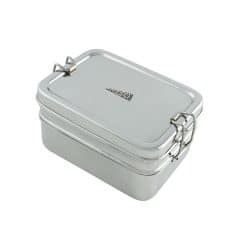 Please note that because the lid does not have a plastic seal, there could be some leakage if used with very wet foods. Not for use in microwave. Dishwasher safe. Bottom Layer – 14.5 x 4 x 10 cm. 400ml capacity. Top Layer – 15 x 4.5 x 10 cm. 500ml capacity. Overall Dimensions – 15.5 x 7.5 x 10 cm. 900ml capacity. Mini Container – 10 x 4 x 5.5 cm. 150ml capacity. This reusable food wrap is perfect for keeping sandwiches and food fresh, without using any plastic! 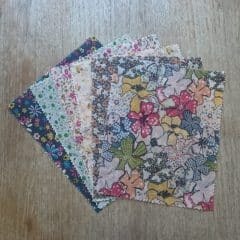 Made from 100% cotton, sealed with a unique mix of soy wax and coconut oil, this wrap can be used for covering food, bowls, cups and jars- and it’ll biodegrade when you’re done with it. It’s water-resistant, meaning it’ll keep food inside fresh whilst keeping the elements out. The wrap can be washed with cool water – hot water will melt the wax and render it no longer waterproof, and soaps will wash the wax out. Keep them dry and away from any heat sources. As the wrap ages, they’ll develop characteristic folds and cracks. This gives it a gorgeous vintage look, but if you don’t like it, simply iron the wrap between two pieces of grease proof paper and it’ll look like new again! You might need to redistribute wax when they arrive. If you do, simply iron as above. This wrap is perfect for those of us who are plastic-conscious and want to minimise the plastic waste we produce. The wax mix made of soy and is 100% vegan and food-safe. You can secure the wraps with string, ribbon or elastic, or sew buttons in if you’re crafty! 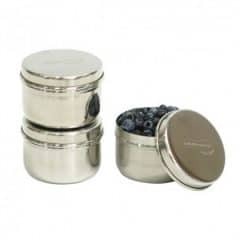 Set of 3 mini stainless steel containers. Ideal for taking snacks to work and storing food items in the home. Great long lasting, and environmentally friendly alternative to plastic. Overall external dimensions approximately 13cm wide x 17cm long x 7cm high. 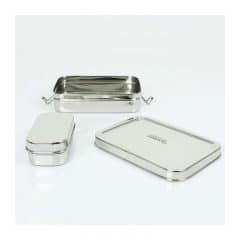 Rectangular stainless steel lunch box with clip closure and a separate mini container which fits inside. 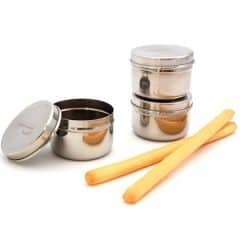 Ideal for taking an ‘on-the-go’ balanced lunch of a savoury salad or sandwich, fruit and a snack to work in one neat container. Overall Dimensions – 13cm x 18cm x 4cm. 700ml capacity. 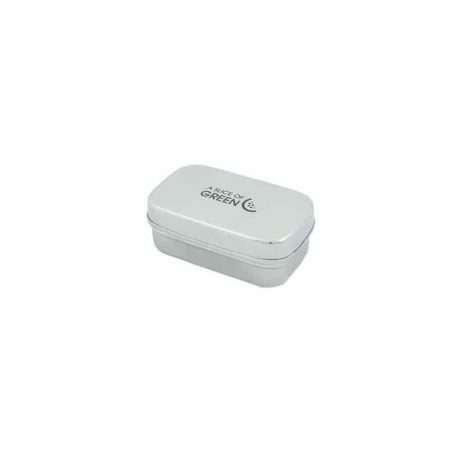 Mini Container – 6cm x 12cm x 3.5cm. 200ml capacity. 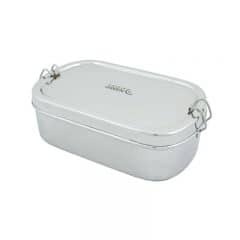 This extra large 1750ml oval stainless steel lunch box has clip closures and is big enough to satisfy even the largest of appetites! 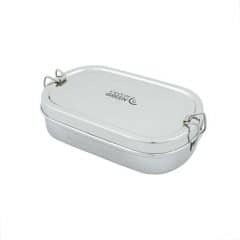 Great for doorstop-style gourmet sandwiches which never fit into a regular sized lunch box, as well as using for general food storage at home and out and about. Please note that because the lid does not have a plastic seal, there could be some leakage if used with liquids. Unlike plastic, stainless steel is non-toxic and non-leaching and will not retain or impart flavours. Overall Dimensions – 13.5cm wide x 22.5cm long x 7cm high. 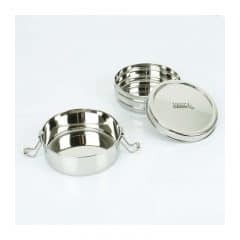 Oval stainless steel lunch box with clip closure and a separate mini container which fits inside. 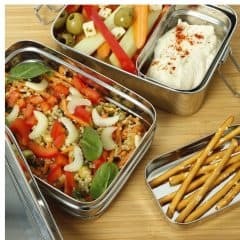 Ideal for taking an ‘on-the-go’ balanced lunch of a savoury salad or sandwich, fruit and a snack to work in one neat container. Please note that because the lid does not have a plastic seal, there could be some leakage if used with liquids. 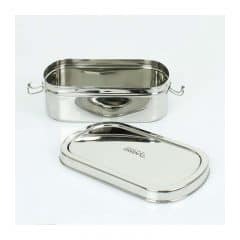 Unlike plastic, stainless steel is non-toxic and non-leaching and will not retain or impart flavours. 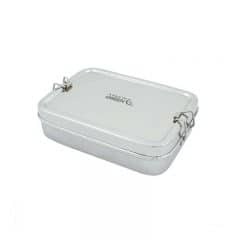 Lunch Box – 19 x 5 x 10.5 cm. 450ml capacity. Mini Container – 10 x 3.5 x 6.5 cm. 200ml capacity.